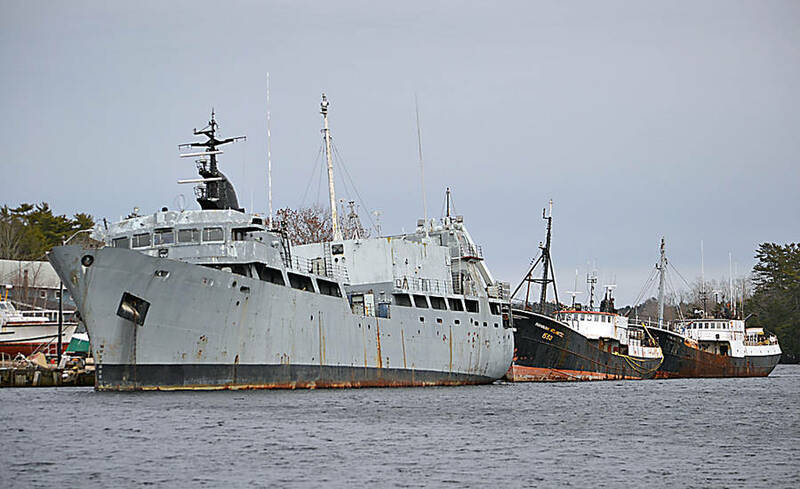 Tracy Dodds, the owner of the abandoned 120-foot trawler at the Port of Bridgewater, Ryan Atlantic II, owes $380,000 in salvage costs pertaining to incidents in 2014 and 2017, according to the Federal Court. The court rendered its judgment February 5 in a case brought before it by the Ship-source Oil Pollution Fund, (SOPF), the Canadian agency mandated to recover clean up costs for marine oil pollution originating from ships. And in another judgment on the same day, the Federal Court declared that Dodds also owes the fund $2 million in costs pertaining to his former vessel the Farley Mowat, which languished in the Port of Shelburne for about three years and resulted in three salvage incidents before it was removed in July, 2017. The recovery operations were orchestrated and paid for by the Canadian Coast Guard, via the fund. "Canada has adopted the polluter pay principal. Damage was caused here to Canadians in that the Coast Guard went in and incurred costs to mitigate and remediate oil pollution from this vessel," the lawyer for the fund, David Côté, told LighthouseNOW. "The court basically agreed with the fund's assessment that what the government did, through the Canadian Coast Guard, was a reasonable thing to do at reasonable cost. "And then the court ordered that the polluter should pay, which is a win for Canadians," he explained. The SPOF was launched in the 1970s by a statute of the Canadian government and capitalized by oil handlers and importers who had to contribute money based on the volume of oil they dealt with. However, Côté was not optimistic the fund would be able to recover much money from Dodds. He said the file deposited in court indicated there was a search of his assets. "It doesn't look like there's a lot there," he commented. "And this is typical of the types of vessels that we mostly see. "There's no mandatory insurance requirement for a lot of them and the people who owned them typically don't have the assets or insurance cover, and so recovery is always difficult for us, even when we win," said Côté. A scrap metal dealer from Wolfville, Dodds was jailed for 20 days and fined in 2017 after he refused to remove the Farley Mowat from the Port of Shelburne. Côté said he couldn't say exactly what the fund's next steps might be, "but we have a tool kit of legal means and we'll do everything we can to try to get some money back," he suggested. "We are the backstop for Canadians who suffer pollution damage and ... Canadians expect us to go after polluters. "And in some cases make an example of them," SOPF's lawyer said. He noted that the two judgments add up to "millions of dollars worth of damage caused by an irresponsible ship owner." Last spring, Rick Welsford, the owner of the Port of Bridgewater, received a Federal Court judgment concerning the Hannah Atlantic, and the Ryan Atlantic II, which is more widely known by its former name, Cape Rouge. Hannah Atlantic is also owned by Dodds and continues to languish in the port. "What the judgment allows me to do is entertain any offers and make a recommendation back to the court," Welsford told LighthouseNOW at the time, adding that any offer must include a plan of how the prospective owner would remove the two trawlers. Following this latest ruling by the Federal Court, he reported to the newspaper that there have been "a number of visitors" inspecting the ships. "But we haven't received any firm offers, so there's been nothing to take to court to request permission to sell them," said Welsford. Welsford also commented that the issue regarding the Cormorant, a third vessel languishing in Bridgewater, "goes on and on and on." According to Côté, the fund would be attending a Federal Court hearing in Halifax March 5 to try and recover salvage costs incurred when that vessel toppled onto the port's jetty in March, 2015. Cormorant, which does not have Dodds listed as its owner, has been caught up in a tangled legal net of ownership disputes, lawsuits and allegations of sabotage.